A single mother of two Thursday become the national capital's first woman electric rickshaw driver. "I couldn't have been happier," 33-year-old Kohinoor said after receiving the emission-free three-wheeler from Union Minister for New and Renewable Energy Farooq Abdullah here. Kohinoor used to work as a maid at a school, earning Rs.5,000. "I now hope to earn its double," she said. Currently, 12 e-rickshaws ply between Malviya Nagar Metro Station and Select City Walk mall in Saket. All the drivers are men. Now, 10 more women from poor families will be given the rechargeable three-wheelers under the 'Ummeed Ki Rickshaw' project. The minister said that with petrol and diesel prices rising constantly, this is a much-needed beginning. "Like Kohinoor, hope many other women learn this (e-rickshaws), which will help them run the household and educate their children," he said. "Its easy to operate. I learnt it in two days," Kohinoor said. She will ply the rickshaw between Jamia Extension and Jamia Millia Islamia -- a distance of three kilometres-- and charge Rs.10 per passenger. The rickshaw can carry up to two passengers and its maximum speed is 20 km per hour. The driver does not need a licence since the vehicle's maximum speed is below 25 km per hour. The e-rickshaw needs six-eight hours to recharge, and the facility is provided at the Centre for Equity and Inclusion (CEQUIN), an NGO. The 'Ummeed Ki Rickshaw' scheme, under which the vehicle was given, was started by a 16-year-old girl. "I joined hands with CEQUIN and started this initiative four months ago to empower disadvantaged women," said Avani Singh, a Class 11 student. "We are planning to give 10 electric rickshaws in a year to women who are economically backward. We are also seeking corporate sponsorship for the e-rickshaws," she said. 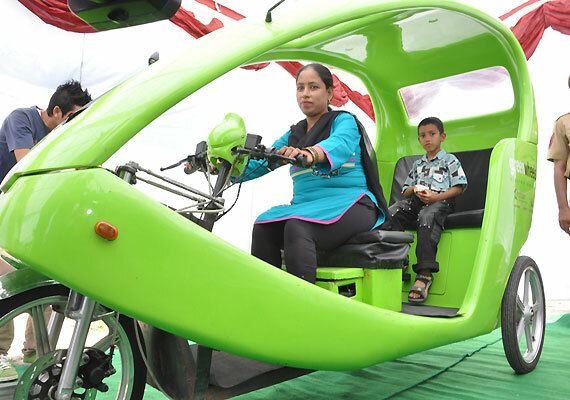 The e-rickshaws have been developed by Green Wheels.